What makes you different than any other practice I can visit? We're different than most other practices in at least several ways. First, we're great relationship builders. That's probably because one of our top priorities is taking the time to get to know you-- offering a listening ear and treating you as a person rather than just another set of teeth to clean and fix. Though in today's hectic world it may seem that dental health and overall well-being aren't related, we're certain they are. A second characteristic that sets us apart is our interest in, study of, and use of the latest dental technologies -- but, without jumping into untested waters. We feel strongly that technology can dramatically improve care, but not every fad is a good idea. We know that people want products that will last them and not contribute to any health problems. So while we work to stay acutely aware of healthful break-throughs, we don't get on every band-wagon. Still, with today's advanced materials, methods, and equipment, there's very little we can't do to improve a smile and change a life! The first time you visit our office, we strive for two goals: one, to provide you with the most comfortable, pleasant dental experience you've ever had; and two, to get to know you as thoroughly as possible. We suggest you allow at least two hours for the appointment. We'll take whatever time is needed to learn about your medical history, dental health history, concerns and areas of anxiety, and any urgent problems. We'll also do a comprehensive exam, observing and asking questions about everything from plain old tooth decay and periodontal disease, to warning signs of clenching and grinding, TMJ, oral cancer, bite misalignment, and even general health issues such as blood pressure and nutrition. While this may sound like a lot of information, we're convinced the better we know you, the more appropriately we can assess your health and help determine the best route of care for you. Here is a brief interview with Philadelphia General and Cosmetic Dentist Dr. Richard J. Walicki, where he answers questions about a patient's first visit and explains his practice philosophy. We have several whitening options designed to fit almost every budget. From pre-packaged take home products, to customized whitening trays for superior results, to Power Bleaching, for the whitest shade your teeth can naturally achieve. We even have solutions for people who are not whitening product candidates. In these cases we may create their bright new smile through the use of bonding or porcelain veneers. Please ask at our office for more information about these procedures. Cosmetic dentistry isn't always just about good looks. Many of these treatments can improve various oral problems, such as correcting your bite. They are also not necessarily restricted to the teeth. Some people encounter problems with gum pigmentation or uneven gums. Periodontal procedures exist that address these difficulties as well. What can I expect the changes will look like? What should I experience throughout the course of treatment? What type of maintenance will be required by me or by the dentist? Television has certainly popularized cosmetic dentistry with such shows as Extreme Makeover and, at times, it can be as complex as a total smile reconstruction. At other times, cosmetic dentistry may be as simple as correcting the appearance of a single tooth. In short, it is what is right for you, what fits your budget, and makes you feel better about your smile! What different payment methods do you offer? We accept cash, personal checks and several major credit cards. Ask us about the five percent courtesy fee reduction we offer for pre-payments! We are also happy to provide a referrals to CareCredit, a group that provides limited time interest free financing for health-care procedures, with a minimal monthly payment. For more information, please click on their link or ask us for application information during your visit. Dental insurance is intended to cover some, but not all, of the cost of your dental care. Most insurance plans have a deductible, typically $50 to $100, and they pay only a specified percentage for each type of treatment. They also have a yearly maximum of funds that they make available for your dental care. Among the limitations are things like co-insurance provisions (meaning, restrictions imposed when you are covered by more than one insurance company -- such as you may find when spouses have separate insurance plans that also cover other family members), pre-existing condition limitations, and certain other expenses which must be paid by the patient. While dental insurance can help people pay for dental treatment, it is helpful to familiarize yourself with your plan. Reimbursement amounts are not, and never have been, a guideline for quality care. It may be useful to remember that insurance is a benefit provided by your employer. Each plan is different and covers different amounts. There can even be different plans provided by the same insurer. While it is not meant to be all inclusive, or a determining factor in treatment recommendations, we recognized that it can provide valuable financial assistance for your dental care needs. Many insurance companies have a yearly maximum of only $1000. Unfortunately, dental insurance is not cumulative, so if you don’t use it within your coverage period (usually a calendar year), you lose it. It is interesting, and disappointing, to note that when dental insurance companies became common in the early 1970’s, the yearly maximum for many was the same $1000 it is today. In the meantime, the cost of delivering dental care has nearly tripled since then, and as for the cost of living -- well, most people don't need to be informed about that. In this day and age, we know deciphering your insurance benefits can be confusing. That's why we will file your claim for you. Please provide us with your insurance plan information on or before your first visit. We will work with you to ensure that you receive the maximum benefits to which you are entitled. If you have any questions about your specific insurance plan or payment options, please call one of our friendly staff members at 215-634-7006. Absolutely! The highest compliment a patient can pay us is to refer us to their family or friends as a recommended dental health-care provider. Please note that not every person is accepted as a patient into our practice, however. We only accept those individuals we feel we can honestly help. Also, because we pride ourselves in maintaining a happy and caring environment, we see our patients as friends. Thus, we do not expose our friends to people who are excessively negative, are not willing to take responsibility for improving their health, or consistently demonstrate bad manners. As a result of the ongoing controversy surrounding the use of mercury fillings, our office policy continues to be the use of tooth-colored fillings. It was once believed that the mercury in the so-called “silver fillings” was stable and did not escape. We now know that trace levels of mercury vapor are released over time. It has also been determined that these trace levels of mercury vapor combine with common oral bacteria (streptococcus mutans) to form methyl mercury - a substance said to be significantly more toxic than free mercury itself. Methyl mercury exposure in adults has also been linked to an increased risk of cardiovascular disease including heart attack. Some evidence also suggests that methyl mercury can cause autoimmune effects in sensitive individuals. It is well established that mercury is itself a poison and that in large doses it can affect the body severely. What we don’t know with certainty is the cumulative effect of low doses of mercury, or methyl mercury, over time. White composite fillings offer many advantages to the patient, apart from the absence of mercury. They look natural, don’t discolor neighboring teeth or gum tissues, and by the mechanism of bonding can actually reinforce weakened tooth structure. New formulations in recent years have also significantly improved their durability, making them a standard, trustworthy - and safe - option. Your safety has always been our priority. This is why our office has been mercury-free long before it became the “fashionable” thing to do. Where can I find that dental product we discussed? From time to time we may mention a dental product that can help your particular dental condition. We also realize it isn't always easy to remember everything reviewed at your visit. For that reason we have compiled a list of various items we may have discussed in one convenient location. Still, if there is something we talked about that you can't find referenced here, please don't hesitate to call our office. Clck HERE to view the ToothWiz Health Store. From Cherry Hill, NJ: Take RT-90 West towards Betsy Ross Br/Camden. Road name changes to Betsy Ross Bridge. Take ramp for I-95 South toward Central Phila. At exit 25, take ramp right for Allegheny Ave toward Castor Ave. Turn right onto E. Allegheny Avenue. Arrive at 2260 E. Allegheny Avenue, Philadelphia. The last intersection is Tulip Str. If you reach Weikel Street, you’ve gone too far. From Bensalem, PA: Take I-95 South. At exit 25, take ramp right for Allegheny Avenue Ave toward Castor Avenue. Turn right onto E. Allegheny Avenue. Arrive at 2260 E. Allegheny Avenue, Philadelphia. The last intersection is Tulip St. If you reach Weikel Street, you’ve gone too far. Take I-95 North toward Philadelphia/Chester. At exit 25, take ramp right toward Allegheny Avenue/Castor Ave. At end of ramp, turn right onto E. Westmoreland Street (Road name changes to Bath St). Turn right onto E. Allegheny Avenue. 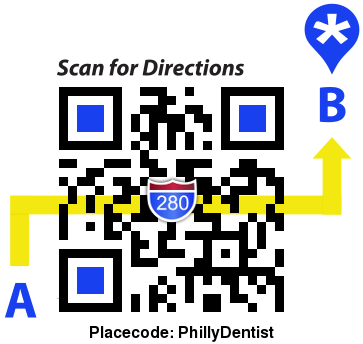 Travel about ½ mile and arrive at 2260 E. Allegheny Avenue, Philadelphia, PA 19134 on your left. The last intersection is Tulip Street. If you reach Weikel Street, you’ve gone too far. Mass Transit Please note: Check local maps and listings as schedules and routes may change. From Northern Liberties (19123 & 19125): Take the #5 bus from 3rd St. & Fairmount Ave. station. Get off at Frankford Ave & Allegheny Ave. Start out going North East on Frankford Avenue towards E. Allegheny Avenue. Turn right onto E. Allegheny Avenue. It is then a 5 minute walk to 2260 E. Allegheny. From Northern Liberties (19124): Take the #3 bus to K & A, then take the #60 to EAST Allegheny Ave. Turn left onto E. Allegheny and arrive at 2260 E. Allegheny. From Burholme (19111): Take the #67 bus from Cottman Ave. & Tabor Ave. station heading to Frankford Trans Ctr. Get off at Frankford Trans Ctr Main Dropoff. Start out going South West on Frankford Ave. towards Granite Street (3 minutes). Take the #3 bus from Frankford Ave. & Drye Street station heading to Frankford Trans Ctr. Pass Frankford Trans Ctr Rts. 3 & 5 dropoff. Trip continues (stay on board) on #5 bus from Frankford Trans Ctr Rt 5 station heading to Front-Market. Get off at Frankford Ave & Allegheny Ave. Turn left onto E. Allegheny Avenue. Walk 5 minutes to 2260 E. Allegheny Avenue. From Bridesburg (19137): Take the #73 bus from Orthodox St & Salmon St Station heading to Richmond-Westmoreland. Get off at Richmond St & Westmoreland St Loop. Transfer. Take the #60 bus from Richmond St. & Westmoreland St. Loop station heading to 35th – Allegheny. Get off at Allegheny Ave. & Tulip St. Walk to 2260 E. Allegheny Avenue. From Northwood (19149): Take the #14 bus from Roosevelt Blvd & Magee Avenue heading to Frankford Trans Ctr. Start out going South West on Frankford Ave. towards Granite Street (3 minutes). Take the #3 bus from Frankford Ave. & Drye Street station heading to Frankford Trans Ctr. Pass Frankford Trans Ctr Rts. 3 & 5 dropoff. Trip continues (stay on board) on #5 bus from Frankford Trans Ctr Rt 5 station heading to Front-Market. Get off at Frankford Ave & Allegheny Ave. Turn left onto E. Allegheny Avenue. Walk 5 minutes to 2260 E. Allegheny Avenue. Our office is located diagonally across from The Northeastern Hospital (formerly of Temple University). Ample street parking is available (no meters). Caution: Do not park directly in front of the office as this is a bus zone and you may risk ticketing. Unfortunately, hospital parking is no longer available to the general public.